A final report of at least 2 pages must be completed at the end of the term. Students must also make a presentation about their research. This form is to verify presentations by MSGC funded students and give MSGC staff the ability to attend the presentations. If you are awarded an internship you must complete the Responsible Conduct of Research (RCR) training course. The Summer Undergraduate Pay Scale Rubric can be found here. A personal statement is required for all summer internships. Instructions and tips for this statement can be found here. The MLC has been serving students and teachers in the STEAM fields since the 1980s. They will be hosting 20 different camps for students entering grades 1st - 12th this summer. The MLC is located on a beautiful 10-acre campus as Canyon Ferry Lake. The MLC has an observatory complex that features Montana's largest public-use telescope, perfect for viewing the night sky. People from all over come to enjoy this resource. 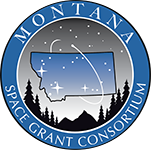 The MLC has been selected by NASA to host the Apollo Next Giant Leap Student Challenge for Montana. The ANGLeS Challenge is an immersive opportunity for middle school and high school students to use the latest technologies in aeronautics and robotics to explore, inspire, create, and achieve. Teams from around Montana will come to the MLC in July to recreate the historic Apollo 11 lunar landing. The MLC also hosts the Montana Aerospace Scholars program for the Museum of Flight in Seattle/NASA. Each year high school sophomores and juniors come to the MLC for an aeronautics experience where they plan and carry out a mission to Mars. Visit the Apollo 50 website for more project information. Participants must be a full-time registered student (previous two semesters/three quarters) at a Montana campus and must be intending to enroll full time for the fall, have a GPA of 3.0 or higher, have an interest in education/working with the general public/kids and space science. This opportunity is for students from all MSGC affiliated campuses. Pay ranges from $5000 - $7,300 for ten weeks full time work depending on experience. Room and board provided at the MLC when camps are in session. The MLC seeks to host two NASA interns at its campus summer 2019. Application Deadline - April 2019 or until filled. Sustainable Bioproducts Inc seeks to partner with MSGC by providing opportunities for students to work as interns at their Bozeman R&D facility. SB is a growing biotech company that uses novel fermentation technologies to produce a wide variety of high-value products. SB is currently working with scientists at NASA and MSU to advance a fermentation technology that would enable in-situ biomanufacturing from wastes that are generated under space mission conditions. Students working at SB will gain valuable experience in microbiology and bioengineering within a research environment that fosters innovation. Preference for Bio or Chemical Engineers and Microbiologists with experience using aseptic technique and working with microbiological fermenters. Students with research experience in biofilms are highly desirable. Up to three students, sophomores through seniors, from MSGC Affiliate campuses will have the opportunity to participate in the development of space science/engineering experiments at the Space Science Engineering Laboratory at the MSU – Bozeman campus. Students will receive complete training and mentoring from MSU students and SSEL staff experienced in space hardware design. SSEL programs to design, fabricate, test, and fly systems in the space and near-space environment include rockets, balloons, and satellites. Visit the SSEL website for more project information. This opportunity is designed to enable college students to participate in a missionlike team environment where students design, build, and fly space hardware. There will be approximately twenty students working in the SSEL over the summer on a variety of group or individual projects. science or space engineering. This opportunity is for students from all MSGC affiliated campuses. Pay ranges from $5000 - $7,300 for ten weeks full time work depending on experience. Application Deadline - March 8, 2019. Sunburst Sensors designs and manufactures autonomous instruments to measure the carbonate chemistry of marine and freshwater helping scientists understand important processes, such as ocean acidifcation. Our products operate for long periods with ultra-low power and reagent consumption, providing valuable time-series data to researchers around the world. We are developing other instruments for the measurement of alkalinity, carbonate ion, and total carbon. Sunburst Sensors won the Wendy Schmidt Ocean Health XPRIZE in 2015 in a competition that drew teams from around the world to develop accurate and affordable pH sensors. Sunburst Sensors is considering summer 2019 positions for motivated interns interested in working with them on a number of possible projects. These positions are located in Missoula, MT. Pay ranges from $5000 - $7,300 for ten weeks full time work depending on experience. to coordinate and guide faculty, staff, and students in Montana for understanding and decision-making regarding implementation of UAS in a changing research and regulatory environment. to establish the infrastructure and resources in order to create sustainable autonomous aerial research. AASO is considering summer 2019 positions for motivated interns interested in working on a number of possible projects. These positions are located in Missoula, MT on the University of Montana Campus and with Ranch Advisory Partners in Montana, Wyoming and/or Colorado. Pay ranges from $5000 - $7,300 for ten weeks full time work depending on experience. Projects include weather research with UAS and assessment of using UAS for quantitative rangeland health monitoring. 10 weeks working with MSGC's high altitude balloon program on the MSU or UM campus. Pay ranges from $5000 - $7,300 for ten weeks full time work depending on experience.